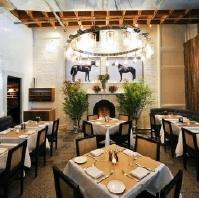 This equine-themed NoHo restaurant, named for two 19th-century racehorses, is quite inviting and homey at first glance. 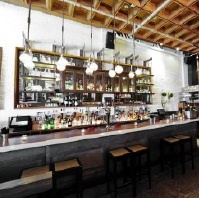 Modern chandeliers show off the rooms at their best: a large bar and two small dining rooms, decorated with white-painted exposed brick and wood paneling that evokes stables. Portraits of the racehorses hold place of pride, and small details remind diners and drinkers alike of the theme, without becoming overwhelming. Those who loved Double Crown, though perhaps reticent at first, will not be disappointed by Brad Farmerie's newest project, already developing a regular following, thanks to its friendly atmosphere and good service. Some come for the bar, with its selection of both classic cocktails, house concoctions – some made with S+P's very own Parole Whiskey – and four non-alcoholic cocktails for those who prefer to stay away from the stronger stuff. Others come for the food, which somehow walks the line between highbrow and no-nonsense, homey fare, with varying degrees of success. Appetizers include chic hand-cut salmon tartare with fried capers and quail egg (12) as well as a simple but no less satisfying carrot, ginger and lemon soup (11), dressed up with a toasted chili marshmallow. Mains include classic cuts of steak – from filet (33) to ribeye (90) – as well as a burger that is turning heads, with dry-aged Angus beef, Havarti, maple bacon and a fried egg (18). Sides of note are the whole grain mustard mashed potatoes (6) and skinny French fries with chili ketchup and blue cheese mayo (6). Be sure to save room for dessert, which is already being touted as the star of the menu, still walking the line between class and homey: chocolate soufflé (12) is served with whiskey ice cream, and homemade cinnamon-sugar doughnuts (9) come with vanilla ice cream and chocolate sauce.